Unless you're Leo desperately trying to score an Oscar, you're probably not going to be fighting a bear anytime soon. 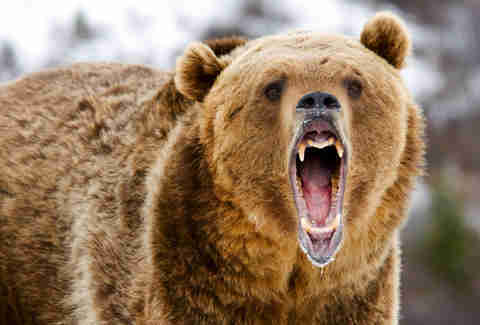 But it can't hurt to know what to do if you ever come face to face with a giant Grizzly. YouTube channel AWE me provides all you need to know about battling a bear, even giving a bit of history about bear/man fights on record. But don't worry, no bears were harmed in the making of this video. Just cartoon bears. The video offers plenty of strategy, but the last bit about cramming your hand down the bear's throat and initiating its gag reflex so it gives up and leaves you alone seems like a winning tactic. Although that does involve sticking your hand in a bear's mouth. Frightening premise, but hell -- you're already being attacked by a bear. What do you have to lose? An arm, actually. But maybe not if this actually works. Additionally: who the hell figured this out? Kara King is a News Writer at Thrillist and had one fight with her teddy bear. Send news tips to news@thrillist.com and follow her at @karatillie.